produced; they all contradict each other, and none is remotely plausible. 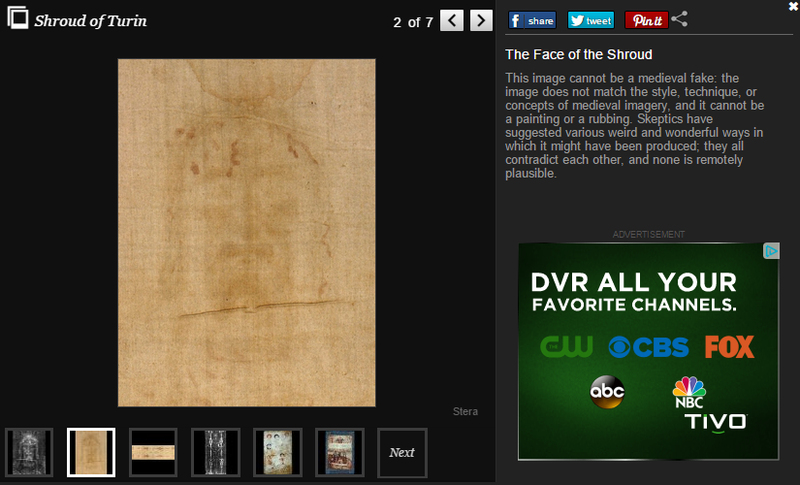 In a 2011 book, British scholar Charles Freeman suggested that the shroud was created for medieval Easter rituals. The earliest mention of the shroud he could find was in 1355, when the cloth was displayed at a chapel in Lirey, France. “On Easter morning the gospel accounts of the resurrection would be re-enacted with ‘disciples’ acting out a presentation in which they would enter a makeshift tomb and bring out the grave clothes to show that Christ had indeed risen,” Freeman told The Guardian. Italy’s former royal family, the House of Savoy, acquired the shroud in 1453. Freeman says the family “converted” the cloth “into a high-prestige relic” in order to bolster the kingdom’s reputation. This image cannot be a medieval fake: the image does not match the style, technique, or concepts of medieval imagery, and it cannot be a painting or a rubbing. Skeptics have suggested various weird and wonderful ways in which it might have been produced; they all contradict each other, and none is remotely plausible. The Shroud was first photographed in 1898, revealing that it is an astonishingly realistic negative image. This unequivocally proves that the Shroud cannot be a medieval man-made forgery, for no one knew how to produce such an image in those days – or would have wanted to. And no, Leonardo couldn’t have either – apart from anything else, he was born a century after the Shroud is first documented in France. Folio 28r of the Pray Codex, a Hungarian manuscript produced between 1192 and 1195, depicting two scenes from the Passion. Most people believe the Shroud is a fake due to the 1988 carbon-dating test, but the botched sampling of the cloth and the last-minute abandonment of agreed-upon procedures mean that the carbon-dating test had severe flaws. Carbon-dating is by no means 100% reliable, and the carbon-dating of ancient cloths appears to be particularly error-prone. Contamination or a medieval repair can account for the problematic Shroud test. This miniature painting, dating from the 1190s, depicts the Shroud, complete with a distinctive pattern of burn-marks, at least a century before the date suggested by the carbon-dating. The India-born or American of Indian origin Carol Kuruvilla is Associate Religion Editor at Huffington and wrote a balanced report, probably because of her background. Huffington is a mixed bag and can sometimes, unfortunately, confuse people with their pluralistic approach. A question that has always intrigued me about the Shroud being a painting, is why has no other work by the artist ever surfaced? Steve. I have just been visiting the Cathedral Museum in Ferrara. They have a wonderful set of sculptures of the months, each of the survivors from the original twelve having beautifully sculpted figures. We do not know who the sculptor was nor do we have any other works of art that are recognisably his so he is simply known as the Master of the mese( months) in Ferrara. This is quite common as documentation is often very poor and names and works have been lost. If the artist of the Shroud specialised in painted linens , so few have survived that it would be highly unlikely that we would have any others left by him. So that is not really an issue here.